Expression of MHC class II genes by epithelial cells is induced in inflammatory conditions such as autoimmunity and organ transplantation. Class II ligands generated by the epithelial cell processing mechanisms are unknown, although some unique epitopes have been described in epithelial cells that B cells could not generate. Epithelial cells are the targets of autoreactive T cell responses in autoimmune diseases and of transplant rejection processes, which may involve recognition of cell type-specific epitopes. In the present report, we have compared the DR4-associated repertoire and the intracellular distribution of class II, invariant chain (Ii), and DM molecules between a human DR4-, Ii-, and DM-transfected rat neuroendocrine epithelial cell line and a homozygous DR4 (DRB1*0401) lymphoblastoid B cell line, by mass spectrometry sequencing techniques, and immunoelectron microscopy. The epithelial cells chosen for transfection, RINm5F, are rat insular cells widely used for human studies of autoimmune diabetes. The results revealed a remarkably heterogeneous pool of self protein-derived peptides from the cell surface and various intracellular compartments, including the cytosol and secretory vesicles in epithelial cells, compared with a very restricted homogeneous repertoire in lymphoblastoid B cell lines, where few epitopes from surface molecules were predominant. The generation of distinct DR4-associated peptide repertoires in these two cell types could be due to the effect of several factors including differences in subcellular location of Ii and DM molecules, differential DO expression, and cell type-specific mechanisms of class II ligand generation. This is specially relevant to processes involving epithelial T cell interactions such as organ-specific autoimmunity and transplant rejection. MHC class II molecules (MHC-II)3 are surface glycoproteins that are the main Ag-presenting molecules to CD4 T cells and are expressed by professional APCs such as dendritic cells, macrophages, and B cells. In the endoplasmic reticulum (ER; Ref. 1), newly synthesized αβ heterodimers assemble with invariant chain (Ii) trimers, forming (αβ)3Ii3 complexes that are targeted to the endocytic pathway (2). Along the endocytic route, Ii is sequentially degraded by proteases (3), leaving single αβ dimers associated to the Ii-derived class II-associated Ii peptide (CLIP) peptides (4). During the peptide cargo process, HLA-DM facilitates high-stability peptide loading in exchange for CLIP or other nonstable peptides and protects empty MHC-II molecules from degradation (5). In B cells, another class II-like molecule, HLA-DO, modulates HLA-DM function in late endocytic compartments (6). The intracellular compartments where peptide exchange occurs were described as endocytic MHC-class II containing compartments (MIICs) in B cells (7). MIICs are morphologically heterogeneous compartments (multivesicular or multilaminar) that contain endosomal and lysosomal components (lysomal-associated membrane protein-1, CD63, cathepsin D, and β-hexosaminidase) and show different acidity and accessibility to endocytic tracers, indicating different localization in the pathway (8). The resulting stable αβ peptide complexes are transported to the cell surface (9) where they can be recognized by CD4 T cells. In inflammatory conditions such as autoimmunity and organ transplantation, peripheral epithelial cells are induced to express class II molecules (10, 11, 12, 13). In both processes, self Ags can be either presented by the epithelial cells themselves (14) or by professional, host-derived APCs (15) to prime the immune response. Whatever the case, epithelial cells become the unique targets of the pathogenic mechanisms in organ-specific autoimmune diseases (11, 16, 17) and transplant rejection, so cell type-specific features may affect the peptide repertoire presented. Indeed, constitutive expression of class II molecules is mostly restricted to a subpopulation of dedicated APCs that have developed mechanisms for efficient uptake of proteins derived from exogenous microbial pathogens, while differentiated epithelial cells are specialized in the synthesis and secretion of tissue restricted molecules, like hormones in endocrine epithelia. Thus, differences in the endocytic and secretory pathways as well as the expression of tissue-specific proteases may condition the ligand-repertoire able to bind MHC-II molecules in each cell type. The majority of MHC-II molecules in resting B cell lines and spleen cells are occupied with a mixture of peptides, mostly derived from exogenous, self surface, or endocytic proteins that easily intersect the endocytic compartment (18, 19). No direct data are available on the peptides presented by endocrine epithelial targets in auto- and allospecific responses. However, a role for MHC-II molecules in epithelium can be postulated either in the triggering of the initial autoimmune reaction or in the perpetuation of the response, as suggested by the MHC-II-restricted reactivity to Ag presented by autologous epithelial cells and not by conventional APCs, shown by T cells isolated from autoimmune glands (20, 21, 22, 23, 24). In this report, we have analyzed the naturally generated DR4-associated peptide repertoire in two different cell types of class II positive cells: a transfected neuroendocrine epithelial cell line and a lymphoblastoid B cell line (LCL), as models of nonprofessional APC and constitutive class II-positive cells, respectively. A rat insulinoma cell line (RINm5F; Ref. 25) was stably transfected with human HLA-DR4 (DRB1*0401), Ii, and DM molecules (26), and was compared with a DR4-homozygous LCL. The choice of the rat insulinoma RINm5F cell line was based on its wide use in studies of human autoimmune type 1 diabetes (DM1) as a source of DM1-related islet autoantigens such as GAD, CPH, or preproinsulin, and on the absence of well differentiated human islet cell or other endocrine epithelial cell lines. Furthermore, RINm5F cells express islet Ags capable of inducing T cell responses from human diabetic patients (27, 28). The relative levels of DR/Ii/DM expression in the epithelial cells were not matched to standard APC, but rather to MHC-II-positive autoimmune thyroid follicular cells. A high variability of expression of the three molecules was found in thyroid samples, but as in our transfectants, the relation DR>Ii>DM was respected (29). Our data demonstrate that DR4-associated ligands from the endocrine cell were more heterogeneous in sequence and origin, displaying a broader spectrum of the inside cell contents. In contrast, the DR4-peptide repertoire presented at the LCL-surface is mainly constituted by numerous nested sets of surface peptides sharing few core regions but varying the N- and C-terminal extensions, and also included a few cytoplasmic epitopes, as previously described (18, 30, 31). In addition, the differential subcellular localization of Ii and DM molecules together with the sequences identified suggests that DR-peptide loading may take place in deeper endocytic compartments of epithelial cells compared with an earlier loading in LCLs. The data suggest that intracellular pathways allowing presentation of endogenous peptides by class II molecules are more efficient in epithelial cells than in B cells and these results could well be related to the presentation of endogenous Ags by epithelial cells in autoimmune diseases. A transfected cell line, RINm5F-DRB1*0401-Ii-HLA-DM (DR4IiDM), derived from the class II-negative, class I-positive rat insulinoma cell line RINm5F, was used as a source of class II molecules. A homozygous DRB1*0401 B-LCL (GPJ, HLA-A2, 69; B44, 35; Cw04, 05), was used as a conventional class II-positive control. The HLA-DR-specific murine IgG2a mAb L243 (Ref. 32 ; American Type Culture Collection, Manassas, VA), specific for HLA-DR αβ dimers was used for affinity chromatography. The following Abs were used for electron microscopy labeling: DRα, a DR α-chain-specific serum; Icc5, a serum specific for an epitope of the Ii lumenal domain (33), and 5C1, an mAb that recognizes the DM α lumenal domain (34). L243 and 5C1, together with VIC-Y1 (35) and CerCLIP (36), were used for DR, DM, Ii, and CLIP-DR staining by flow cytometry. Intracellular staining was detected in cultured LCL and transfected cells after fixation with 4% paraformaldehyde (PFA) in PBS for 20 min at 4°C and permeabilized in 1% FCS, 0.1% w/v NaN3, and 0.1% saponin in PBS for 1 h at 4°C. The cells were then incubated with anti-Ii and anti-DM Abs in staining buffer (1% FCS, 0.1% w/v NaN3, 0.5% saponin in PBS) for 30 min at 4°C. Alive cells were used for CerCLIP.1 staining, and surface DR. Ab binding was detected with goat anti-mouse-FITC. Samples of 10,000 cells were analyzed with a FACSCalibur using the CellQuest software (both from BD Biosciences, Mountain View, CA). Cultured cells were fixed for 30 min in a v/v mixture of culture medium and 2× fixing solution (0.25% glutaraldehyde and 4% PFA in 0.1 M phosphate buffer (pH 7.4)). A second fixation step was done with 1× fixing solution (final concentration 2% PFA, 0.125% glutaraldehyde) for 2 h at room temperature. The fixed cells were gently scraped from the culture flask with a rubber policeman, pelleted, and stored in 2% (w/v) PFA. The cell pellets were washed in phosphate buffer and resuspended in a small volume (0.5–1 ml) of 10% gelatin. The gelatin-embedded pellets were cut into 2-mm blocks and infused with 2.3 M sucrose by rotation at 4°C for 2 h as described, (37) and frozen in liquid nitrogen. Ultrathin 80-nm cryosections were cut at −120°C with an Ultracut FCS ultracryomicrotome (Leica, Wien, Austria) and collected with a v/v mixture of 2% methylcellulose and 2.3 M sucrose. Single or double immunogold labeling was performed with different Abs and protein A-coupled to 10 or 15 nm gold (protein A gold PAG10 and PAG15). Final contrasting and drying of cryosections were achieved with 2% methylcellulose containing 0.3% uranyl acetate. BSA conjugated to 5-nm colloidal gold particles (38) was used in pulse-chase experiments to label endocytic compartments. The cells were incubated with BSA-Gold for 5 min at 37°C, washed extensively in cold medium, chased for 5, 20, and 80 min at 37°C and then fixed (as above). The intracellular distribution of labeled proteins was quantified in randomly chosen cells from at least three different grids for each single- or double-labeling experiment, directly in the electron microscope and at a magnification of ×15,000. The total number of gold particles accumulated in each compartment was counted in 20 cell profiles per experiment. Under the conditions used for labeling, background staining of mitochondria and/or nuclei was limited to one to two gold particles. Transfected RINm5F cells were grown as adherent monolayers in T175 flasks or cell factories (Nunc, Roskilde, Denmark) using RPMI 1640 medium (Life Technologies, Karlsruhe, Germany) supplemented with 10% heat-inactivated FCS, glutamine, 100 IU/ml penicillin, and 100 μg/ml streptomycin, with the corresponding selection medium (26) at 37°C and 5% CO2. For harvesting, the cells were detached using trypsin-EDTA solution and centrifuged in 50-ml tubes. After two washes in PBS, the pellets were stored at −70°C until used. LCLs were cultured in the same medium without selection in glass bottles and incubated in cell rollers (Bellco Glass, Vineland, NJ). HLA-DR4/peptide complexes from epithelial or LCL cell lysates were purified by affinity chromatography using L243-Sepharose beads; later, low molecular mass peptides were eluted with trifluoroacetic acid 0.1%, according to standard procedures (39). Eluted class II-peptide mixtures were centrifuged through 10,000-Da cut-off ultrafiltration tubes (Centriprep 10; Amicon, Beverly, MA) and collected from the flow-through. The peptide pools were vacuum concentrated and directly separated on a reverse-phase HPLC column (Micro-Reverse Phase column C2/C18, 2.1×100 mm; Amersham Pharmacia Biotech, Piscataway, NJ), using the SMART system. Chromatographic analysis was monitored at 217-nm UV wavelength. One-minute fractions were collected within the range of 5–45% acetonitrile gradient and analyzed by mass spectrometry. Sequence information from all peptides in the HPLC fractions was obtained by tandem mass spectrometry, using an LCQ ion trap mass spectrometer (Thermoquest, Barcelona, Spain), provided with a nanospray source (Protana A/S) from Protana (Odense, Denmark). The samples were evaporated until dry and redissolved in MeOH/H2O 1/1, 1% AcOH; 1–2 μl were loaded in the nanospray capillary. Product ion spectra were obtained by collision-induced dissociation, mainly of the single- and double-protonated peptide molecules. To identify the source proteins of these peptides, the MS-Tag software (University of California San Francisco Mass Spectrometry Facility, San Francisco, CA) was used for comparison with public protein (National Center for Biotechnology Information nonredundant) and DNA (database Expressed Sequence Tags) databases. If no clear match was found, partial or total manual de novo sequencing of the peptide was conducted and the search was repeated using the mass spectrometry-Edman program. Anchor residue preference was analyzed by calculating the proportion of each residue in the DR4-anchor positions P1, P4, P6, and P9 (40, 41). The calculation was done including all peptide-length variants. Surface expression levels of DR and intracellular Ii and DM were compared between the transfectants and LCLs by flow cytometry. Fig. 1⇓ shows the surface expression of DR4 and total Ii and DM in both cell lines, quantified as mean fluorescence intensity (MFI). The absence of rat DO expression in RINm5F cells was confirmed by specific RT-PCR using rat spleen as a positive control, followed by hybridization with a DO-specific oligoprobe (data not shown). 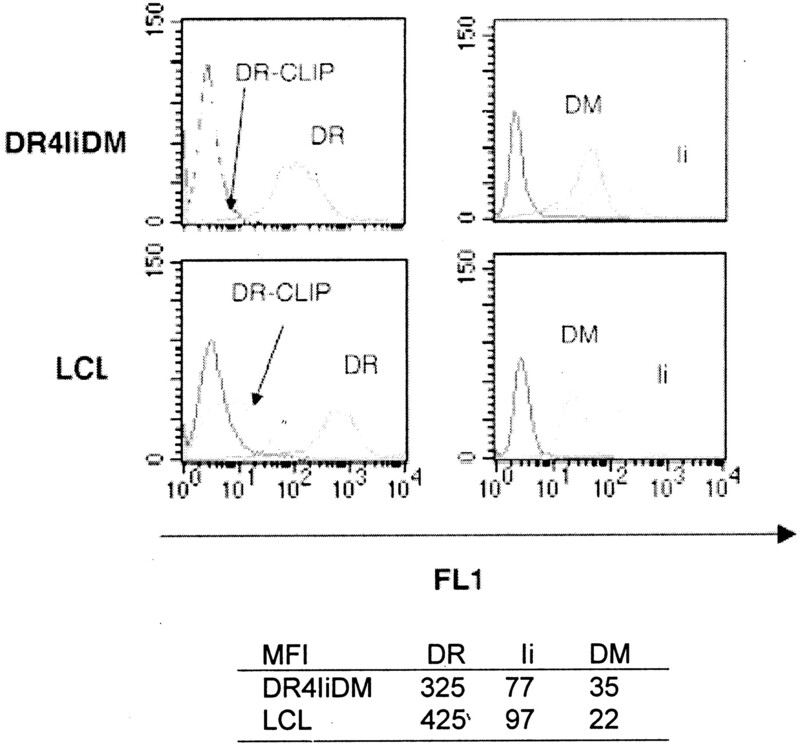 Surface DR and total Ii were higher while DM staining was about half in the LCL compared to DR4IiDM. According to the MFI, the DR/Ii and DR/DM ratios were 4.2 and 9.3 in the epithelial cells compared with 4.4 and 19.3 in the LCLs. No DR-CLIP complexes were found at the epithelial cell surface, but they were detected at low levels in the LCLs. Due to the high retention of the transfected molecules in the ER-Golgi (26), an analysis of the distribution of DR, Ii, and DM in the different cell compartments was done for a more accurate assessment of their location and quantification. Expression of HLA-DR, Ii, DM, and DR-CLIP complexes in RINm5F transfectants (DR4IiDM) (top panels) and control LCLs (bottom panels). Left panels, Surface expression of HLA-DR and DR-CLIP complexes was measured by flow cytometry after staining with mAbs L243 and CerCLIP.1 on live cells. Right panels, Intracellular DM and Ii expression was analyzed by FACS staining on fixed cells. The table shows the MFI for surface DR (L243) and intracellular Ii (VIC-Y1), and DM (5C1) for the two cells. 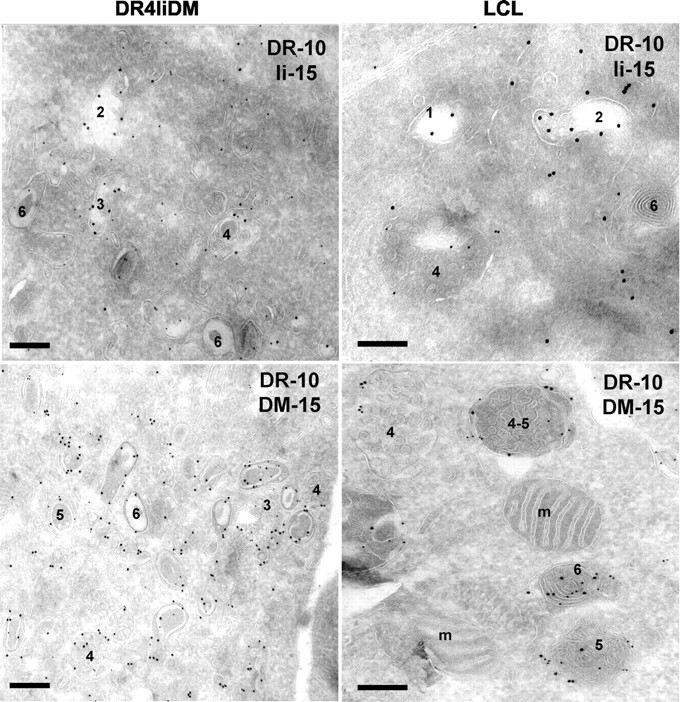 The analysis of the cellular distribution of DR, Ii, and DM molecules in specific immunogold-labeled ultrathin cryosections was done by electron microscopy (Fig. 2⇓). As described in LCLs (42), six types of morphologically distinct class II-containing endocytic compartments were identified in the epithelial cells’ cytoplasm. BSA-gold internalization allowed classification of type 1 and 2 compartments as early endosomes (filled with BSA at 5-min chase), type 3 and 4 as multivesicular late endosomes (20 min), type 5 as prelysosomes (80 min), and type 6 as multilaminar compartments, not reachable by BSA-gold particles before 80 min in epithelial cells (data not shown). Both cells showed maximum DR-positive labeling at the plasma membrane, but a substantial fraction of DR molecules were located throughout the endocytic pathway, from early endosomes to lysosomes. Ii labeling was intracellularly accumulated and mainly located along early organelles, whereas DM labeling preferentially distributed in late endocytic organelles in the two cells. In addition, DR, Ii, and DM labeling were also detected at ER, Golgi, and trans-Golgi vesicles in both cells (data not shown). The distribution of DR, Ii, and DM molecules was quantified by direct counting of 20 cell profiles in the microscope after DR single labeling and DR/Ii and DR/DM double labeling (Fig. 3⇓). The counts confirmed that >80% of total DR labeling was at the cell membrane in both cells, whereas Ii surface labeling was 38% in epithelial cells, compared with 9% in LCLs, and surface DM reached a maximum of 8 and 5%, respectively (Fig. 3⇓). Besides the surface, the highest expression of DR in both cell types corresponded to the compartments classically considered to be MIICs (types 3–6), although DR molecules were also detected in early endosomes. Ii was detected using an Ab that recognizes a C-terminal epitope, which is the first to be cleaved when the DR/Ii complexes reach the endocytic pathway (33), and was mainly detected in types 1–4 compartments in both cells. DM-positive compartments were mostly types 4–6, followed by types 2 and 3, and nearly undetected in type 1 vesicles. Exceptionally, a significant number of DM molecules were detected in type 2 structures in LCLs. Confirming the FACS data, a higher DM labeling was found in the transfected cells; this excess DM was mostly accumulated in late endocytic compartments (types 4–6). 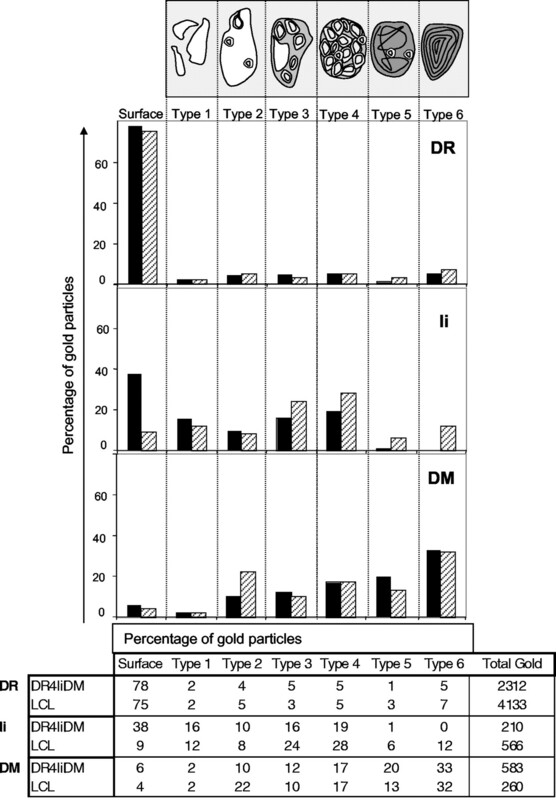 The average number of gold particles associated to DR and DM in the different endocytic compartments varied between the cells. Along the endocytic pathway of the LCL, DR-gold counts ranged between 1 and 2 times the number of DM-gold. In contrast, the transfectants showed a gradient in favor of DM, with a DR:DM of 1:1 in early vesicles compared with 1:4 in the late compartments. Therefore, the ratio between intracellular DR and DM was variable, compared with the high surface DR to total DM ratio of the FACS analysis. Expression of DR, Ii, and DM in the type 1–6 endocytic compartments of DRIiDM cells (left panels) and control LCLs (right panels) detected by immunoelectron microscopy. Ultrathin cryosections were immunolabeled with polyclonal anti-DRα, -Ii (Icc5) sera, and monoclonal anti-DM (5C1) Abs. PAG particles of 10 nm were used for DR labeling, and 15 nm for Ii (top panels) and DM (bottom panels). The different endocytic compartments, numbered from 1–6, are morphologically defined as follows: type 1 compartments are small electroluscent clathrin- or nonclathrin-coated vesicles; type 2 have electroluscent lumen with one to three internal vesicles; type 3 compartments are present internal vesicles with one or two electroluscent areas inside; type 4 are the classical multivesicular bodies, with electrodense lumen, and full of small internal membrane vesicles; type 5 are compartments with an electrodense lumen filled with disorganized internal membranes, some of which contain few internal vesicles; type 6 are multilaminar compartments showing concentrically arranged sheets (onion-like structures). Bars, 100 nm. Quantitative analysis and graphic representation of the distribution of DR, Ii, and DM molecules on the plasma membrane and in endocytic compartments 1–6 of DRIiDM cells (▪) and LCLs (▨). The intracellular distribution of labeled proteins was quantified in randomly chosen cells from at least three different grids for each double-labeling experiment, directly in the electron microscope and with a ×15,000 magnification. Twenty cell profiles were analyzed by counting the total number of gold particles of each size accumulated in each compartment and calculating the percentage of the total amount of particles for each molecule. Both the percentage per compartment and the total number of gold particles counted for each molecule are shown in the table. The graphs show that DR labeling was higher at the plasma membrane and distributed in all other compartments of both cell types. Ii labeling distribution was different: a higher expression (38%) was detected at the plasma membrane of DR4IiDM compared with 9% in the LCLs. Although Ii preferentially accumulated in types 3 and 4 vesicles in both cells, it was detected deeper in the endocytic pathway of LCLs. HLA-DM mainly accumulated in late structures (types 5 and 6) in both cell types; however, a significant amount was accumulated in type 2 compartments of LCLs. Peptides were isolated by low pH elution and 10,000-Da cut-off ultrafiltration from purified DR4 molecules from DR4IiDM and LCLs. Fractionation of the peptide pools by reverse phase HPLC was monitored by UV absorbance at 217 nm. The fractions were collected every minute, and most peptides eluted at 5–45% acetonitrile gradient range. A wider and more complex HPLC profile was obtained from the triple transfectants, compared with a more restricted profile in the LCLs (Fig. 4⇓). 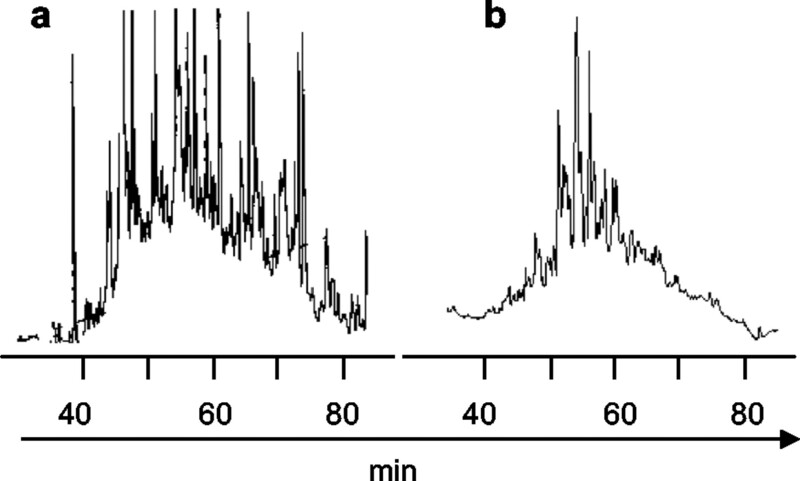 Reverse-phase HPLC profiles of eluted peptides from DR4 molecules expressed by DR4IiDM transfectants (a) and LCLs (b). Peptides were acid eluted from affinity chromatography-purified DR4 molecules expressed by the cell lines and separated by reverse-phase micro HPLC, as described in Materials and Methods. Most peptides eluted within the 5–45% acetonitrile range. Sequence information of the most abundant peptides in the HPLC fractions from the two cell-types was obtained by tandem mass spectrometry. Independent of the cell source, all sequenced peptides matched the predicted DR4 motif (31, 43, 44, 45) and were aligned based on the best peptide score obtained with the matrix that Hammer et al. (44) got by peptide side scanning. Complete sequences of 41 peptides were identified from 25 source proteins in the triple transfectants (Fig. 5⇓). Peptide sizes varied between 9 and 20 aa (952.4 and 2233.2 Da, respectively), although most fell within the 16–18 aa range. No CLIP sequences were obtained from the DRIiDM eluate, thus confirming the FACS data and previous results (28). List of identified sequences of DR4-associated peptides from DR4IiDM-transfected cells. The known peptide sequences are classified according to the localization of the source protein within the cell: exogenous, surface membrane, or cytoplasmic (endocytic or secretory vesicles, ER/Golgi, or cytosol). Id no., database sequence identification no. ∗∗, Identical peptides, with the only difference that the methionine in position 270 is oxidated in the second peptide. All identified DR4 ligands were classified according to the subcellular localization of the source protein. Four peptides had derived from exogenous FCS proteins: transferrin, fetuin, α-1-anti-trypsin, and ferritin L chain. Surface peptides (from rat MHC class I (MHC-I) and ATPase α subunit) were predominant within the remaining sequences, all derived from self proteins. Both epitopes were represented by several length variants, forming sets of nested peptides varying in 1–5 residues at the N- or C-terminal ends. Similarly, nested peptide sets were obtained from all other surface proteins except two single epitopes identified from tissue-specific ephrin-B2 and neprilysin. A total of 40 sequences were obtained from the LCL eluates (Fig. 6⇓). Peptide length ranged between 14 and 26 aa, mostly between 17 and 21 aa. 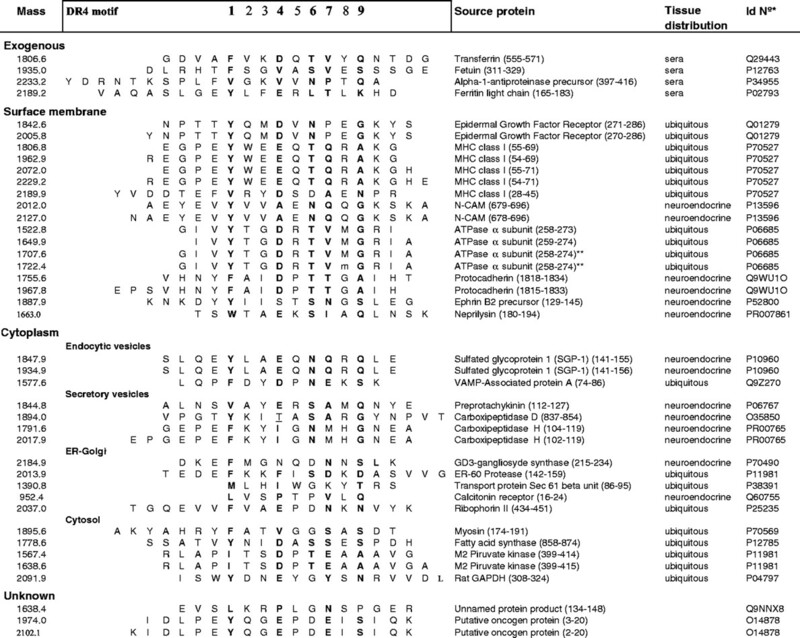 List of identified sequences of DR4-associated peptides from the LCLs. The peptide sequences are classified according to the localization of the source protein within the cell: exogenous, surface membrane, or cytoplasmic. 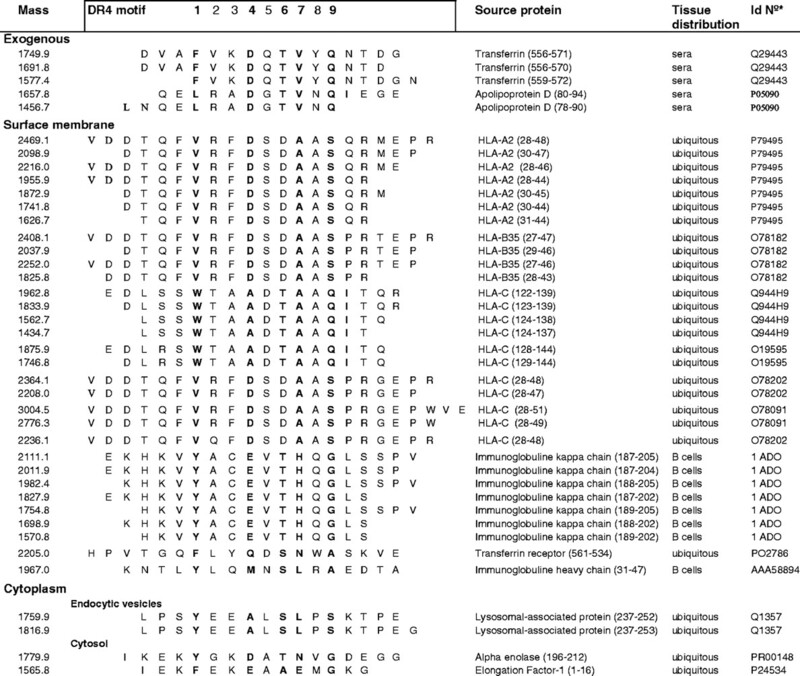 Except for five exogenous peptides from serum proteins, three length variants of a transferrin epitope and two variants of apolipoprotein D, all other peptides derived from self proteins. DR4-associated self-ligands included two nested peptides derived from a lysosomal protein and two from the cytosol (α enolase and elongation factor 1). The 31 remaining sequences derived from a limited number of surface molecules: 22 from HLA-I (five nested peptide sets covering two different regions of the class I molecule), 7 from the Ig κ L chain (all size variants of the same peptide) and 1 from the Ig H chain. Despite the low but visible surface staining with Cer-CLIP Ab (see Fig. 1⇑), no CLIP peptide was sequenced from the LCL fractions. Nearly identical sequences from exogenous bovine transferrin were obtained from DR4IiDM (555–571) and LCLs (556–571). In addition, a conserved MHC-I epitope corresponding to the same region of the α1 domain (28–46 and 28–43) of at least two expressed HLA alleles (A2, B35) and to a rat MHC-I sequence (identification no. P70527) was found in both peptide pools (Figs. 5⇑ and 6⇑). These conserved class I epitopes displayed P1, P4, and P6 common anchor residues. Sequence analysis comparison of the epithelial and LCL repertoires demonstrated a more restricted pattern in the LCL pool (Fig. 7⇓). The epithelial repertoire was dominated by aromatic (78%) in front of alifatic (22%) residues in P1, whereas half (49%) of the DR4 ligands in the LCL presented Val in P1 as described (5). Negatively charged residues (Asp and Glu) dominated P4 in both repertoires, but in their absence, LCL ligands mainly presented Ala instead of the larger amino acids Ile, Val, Ser, and Pro, found in the epithelial repertoire. Similarly, in P6 the pattern was more restricted in the LCL pool, and Ser dominated the P9 anchor in the LCL, but not in the epithelial cell repertoire. Relative proportion of the preferred residues in the main DR4 anchor positions from the peptide repertoires obtained from DR4IiDM cells (▪) and from B-LCLs (▨). Calculation was done including all peptide length variants identified. Further differences were found in relation to the subcellular origin of source proteins, which were grouped in four subsets, according to their accessibility to the endocytic pathway: 1) exogenous; 2) cell surface and endocytic proteins; 3) cytoplasmic nonendocytic including ER-Golgi and cytosol proteins; and 4) proteins from the secretory pathway (Fig. 8⇓). In the epithelial cells, 63% (n = 24) of the identified ligands derived from exogenous, surface, or endocytic proteins, all with direct access to the endocytic pathway. These ligands covered 12 different regions from 11 source proteins. In contrast, 95% (n = 39) of the peptides from the LCLs belonged to the same categories, most from two dominant surface proteins (22 from MHC-I and 7 from Igκ chain). The variability of the 22 class I peptides was restricted to the core-flanking regions, with only two different core sequences shared between them. Similarly, all seven sequences from the Igκ chain covered the same region of the molecule. In addition, 37% (n = 14) of the ligands in the epithelial cell pool derived from proteins from nonendocytic cytoplasmic compartments compared with only 5% (n = 2) in the LCLs. No peptides derived from resident secretory pathway proteins were found in the LCL, compared with 11% (n = 4) in the endocrine cells. Comparison of the cellular localization of proteins generating DR4-associated peptides in epithelial cells and LCLs. 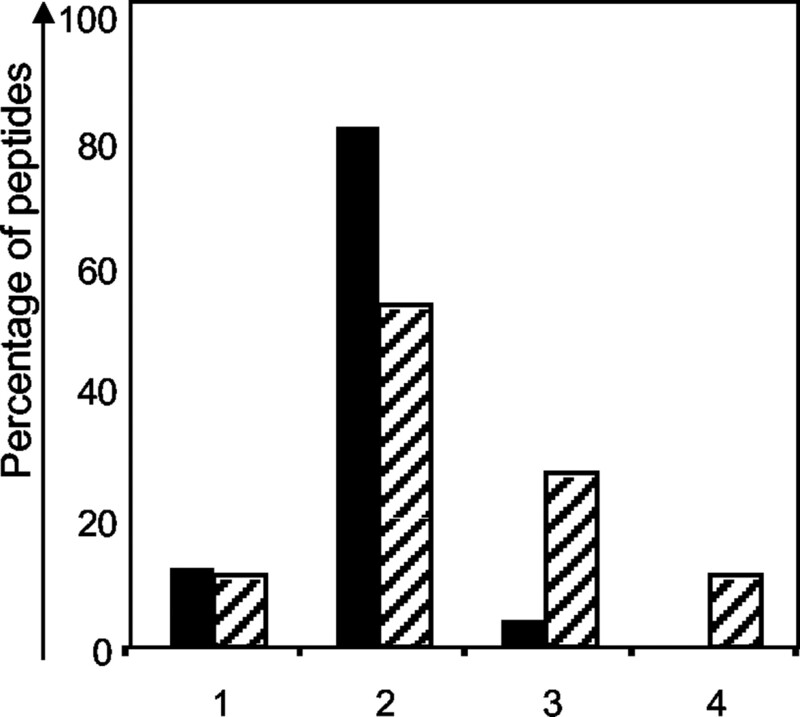 The bars indicate the percentage of peptides from proteins of different location in the DR4 repertoires of the triple transfectants (▪) and LCLs (▨). 1) exogenous (10 and 12%); 2) cell surface or endocytic vesicles (53 and 83%, respectively); 3) ER/Golgi and cytosol (26 and 5%); and 4) secretory vesicles (11 and 0%). In summary, the DR4 molecules from epithelial cells associated to a peptide repertoire which included a large proportion of single sequences derived from surface, secretory, and cytoplasmic proteins, showing high variability in the core sequences. This repertoire was much more homogeneous in the LCLs, where MHC-I and Ig length variants dominated the peptide pool. Class II molecules are expressed in epithelial cell targets in autoimmune diseases, such as thyroid follicular cells in Graves’ disease and Hashimoto’s thyroiditis (10, 46, 47) or some human β cells in type 1 diabetes (48), and in transplant rejection. MHC-mediated parenchymal-T cell interactions can induce different functional outcomes (17, 20, 22, 49, 50) which may depend on the state of the responding cell, the availability of costimulatory signals, or MHC-associated epitopes generated by the epithelial and not by professional APCs (23). In this context, we have compared the repertoire of peptides associated to class II molecules in neuroendocrine epithelial cells and conventional class II positive cells, using rat insulinoma transfectants expressing DR4, Ii, and DM, and a DR4 homozygous LCL. Transfection of RINm5F cells with HLA-DR4, Ii, and DM cDNAs allowed the surface expression of appropriately folded peptide-loaded compact class II molecules (26). A DR4 homozygous LCL, the best standardized cells for the analysis of MHC-associated peptide repertoires (18, 28, 31, 44, 51), was used as control using the same mass spectrometry system, thus avoiding protocol-based inconsistencies. The absence of CerCLIP staining in epithelial DR4IiDM cells and the detection of surface CLIP-associated DR4 complexes in LCLs was the first indication of differences in the composition of the peptide pools (Fig. 1⇑). No CLIP peptides were sequenced from the DRIiDM or from the LCL peptide pool, as published by others in DR4 LCLs (18, 30, 43, 50, 51), although CLIP has been sequenced from other DR alleles (18), reflecting allele-specific differences in the affinity of DR-CLIP interaction. However, the LCL surface staining with CerCLIP may also represent the sum of DR, DP, and DQ/CLIP complexes, including CLIP associated to non-DR4 molecules such as DR53 or the products of DRB7 and DRB8 loci, so the number of CLIP peptides really associated to DR4 would be very small. DP, DQ, and non-DR4 DR molecules are not expressed by the endocrine cell line. Sequence comparison of the two repertoires confirmed higher heterogeneity of the epithelial DR4-associated peptides. The identified peptides are undoubtedly limited and likely the most abundant within the detecting capacity of our system. However, the same limitations apply to the two cells compared, so we considered the peptide pools representative of the most abundant DR4 ligands in two different cell types. Source protein analysis revealed a low proportion of exogenous peptides from the culture serum in both peptide pools, including a common transferrin epitope also reported from other DR4 LCLs (28). Major differences were found when analyzing the remaining peptide sequences, all from self proteins. Many derived from surface or endosomal proteins (53% in DR4IiDM, 83% in LCL), the most likely source of material to encounter DR in the endocytic pathway in cultured cells. MHC-I molecules, highly expressed by LCLs and at lower levels by epithelial cells, generated the most abundant DR4 natural ligands. In the LCLs, all but two surface peptides derived exclusively from class I MHC or another highly expressed molecule, Igκ chain. The same sequences have been reported elsewhere (28, 52), demonstrating a striking restriction of the DR4-associated T cell epitopes in LCLs. The few core sequences with flanking region variations that dominated the LCL-repertoire induced an important restriction in the residue composition of the four anchor positions. In contrast, the heterogeneous pattern found in epithelial cells, with peptides from growth factor receptors, adhesion molecules, and surface-associated enzymes in addition to MHC-I epitopes, resulted in a less restricted pattern. Indeed, the pattern of internalized peptides associated to class II mostly reflected the surface composition of each cell and included cell type-specific ligands like Ig in LCLs or neural cell adhesion molecule in the neuroendocrine cell line. One peptide from MHC-I and a transferrin epitope were common to the two cells, indicating that processing mechanisms able to generate similar DR4 ligands from exogenous and cell surface proteins were acting in the endocytic pathway of the two cell types. The differences in the repertoire content could be in part related to the restricted expression of DO by LCLs and not by epithelial cells (53). DO molecules directly interact with DM-DR complexes modulating DM-editing activity (54, 55) and DM distribution to the external membrane of the multivesicular MIICs (Ref. 56 ; see Fig. 2⇑). This DM redistribution, not observed in the epithelial cells, may intercept the access of internal peptides to MHC-II in the multivesicular bodies of the LCLs, consequently restricting the variability of the repertoire. However, DO is also not expressed in class II-positive human endocrine epithelial cells, so we should indeed expect the absence of DO to affect the peptide repertoire in in vivo situations such as autoimmunity. In accordance with previous data (34, 57), cytoplasmic peptides were practically absent in DR4 LCLs, with only two cytosolic peptides identified. Contrary to LCLs, nearly half of the epithelial cell sequences derived from autologous proteins located in the ER, Golgi, secretory vesicles, and cytosol. These peptides were less abundant but more heterogeneous than surface peptides, indicating that an overlap between the class II pathway and the degradation of cytoplasmic proteins must be occurring with higher efficiency in epithelial cells than in LCLs, and suggest cell type-dependent pathways of class II ligand generation. In addition, many of the epithelial cell peptides were tissue-specific. Little is known about the mechanisms generating these epitopes and the compartments where the intersection with class II may occur. Some peptides derived from proteins associated with internal membranes (ER and Golgi apparatus) or secretory granules. Autophagy events and fusion of secreted granules with class II-bearing late endosomes or prelysosomes could enable such peptide presentation. Besides, the action of proteasoma and other cytoplasmic proteases followed by endosome-translocation mechanisms could be a way for cytosolic peptides to meet class II molecules (58). Although one identified sequence belonged to an ER-resident signal peptide, its short size close to MHC-I ligands (59) suggests that this could be a class I peptide released into endosomes after internalization and captured by class II molecules before its final degradation. This could be an alternative way of interaction between the MHC-I and MHC-II pathways (60). Electron microscopy data showed that peptide-DR binding could occur all along the endocytic pathway in both cells, but cell-type differences were observed for Ii and DM distribution. Ii was more abundant at the epithelial cell surface, despite lower total Ii expression. Surface expression of αβIi complexes followed by rapid internalization to early endocytic compartments is an alternative class II transport pathway in B cells, considered to be predominant in immature DC and other cell types (61). This pathway may also be favored in the epithelial cells according to the increased detection of Ii at their cell surface by EM. The unequal accumulation of DM molecules in late vesicles of the endocrine cells could favor the association of late processed epitopes to DR and would in part explain the abundance of internal peptides in the repertoire and their shorter size. In contrast, a bias in favor of DR loading in early compartments is suggested in LCLs, both by the predominance of nested surface peptides and longer sequences in the repertoire, and also by the relative increase of DM levels in early compartments, agreeing with similar conclusions by other approaches (62, 63, 64). The variations in the preferred P1 residues between the two cell types could reflect the abundance of peptides of similar sequence in LCLs but not in the epithelial cell repertoires. In addition, DO molecules in the B cells should further restrict the effect of DM and limit the preferred residues at the P1 position (64). Similar effects could be applied to the differences in the preferred residues in the other relevant pockets. The homogeneity of the repertoire and the abundance of nested peptide sets agree with the recently described class II molecule organization at the LCL cell surface, where tetraspan microdomains group class II molecules loaded with length variants of a common ligand (65). Therefore, in LCLs the low epitope variability may condition the T cell repertoire, favoring the engagement of few specific high-affinity TCRs or allowing low-affinity T cells to overcome the avidity requirements. In contrast, the heterogeneity of the DR4 repertoire in epithelial cells, poor in nested peptides and rich in internal proteins, could then suggest different surface organization of the class II complexes in addition to different access to internal proteins. Although many of the proteins identified were ubiquitous, some were specific of neuroendocrine cells (GD3 ganglioside synthase, neprilysin, or the calcitonin receptor), including all peptides from secretory vesicles. MHC-associated tissue-specific peptides in epithelial cell targets may contribute to in situ autoimmune processes. Indeed, tissue-specific carboxypeptidase H peptides have been proposed as putative autoantigens in DM1 (66). Thus, class II molecules expressed in epithelial cells could lead to the display of altered peptide sets capable of stimulating otherwise silent T cells. We thank Dr. J. Bonal for help with the Renaflo dialysis system, Dr. M. Costa for the LCLs, Dr. E. Palou for HLA typing of the LCLs, and Dr. R. Pujol-Borrell for helpful discussions and critical review the manuscript. We also thank Dr. P. Cresswell, Dr. W. Knapp, Dr. P. Morton, and Dr. J. Trowsdale for the gift of mAbs, and D. Tenza for technical help with electron microscopy. ↵1 This work was supported by a Comisión Interministerial de Ciencia y Tecnología grant (SAF97-0155) from the Spanish Education Ministry. A.M. is supported by the AP96 Formación de Personal Investigador program of the Spanish Education Ministry. L.S. is supported by a fellowship from the Training and Mobility of Researchers program of the European Community (ERBFMBICT961295). ↵3 Abbreviations used in this paper: MHC-II, MHC class II; MHC-I, MHC class I; LCL, lymphoblastoid B cell · line; Ii, invariant chain; CLIP, class II-associated Ii peptide; ER, endoplasmic reticulum; MIIC, MHC-class II containing compartment; PFA, paraformaldehyde; MFI, mean fluorescence intensity; PAG, protein A gold. Raposo, G., M. J. Kleijmeer, G. Posthuma, J. W. Slot, and H. J. Geuze. 1997. Immunogold labeling of ultrathin cryosections: application in immunology. In Handbook of Experimental Immunology, 5th Ed. I. Blackwell Science, ed. Elsevier, Cambridge, p. 1.